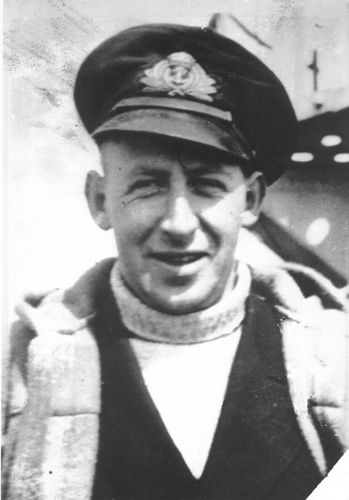 Orme Stuart was born 20 February 1914 and came to Prince Rupert, BC in 1930 to work for his uncle, C H Orme. By 1939, Orme was running his uncle's pharmacy and also an officer in the RCN Volunteer Reserve. With the declaration of war he was mobilized and went overseas. As the RCN was still expanding, he was seconded to the RN where he was to spend the war. By February 1943 he was in command of the corvette HMS Pennywort and in March 1943 was involved in the battle for convoys HX229a and SC122. This was to be one of the largest such battles of the war and he was mentioned in despatches for his part in it. In August 1943 he took command of HMS Abelia. His final command was the Captain class frigate HMS Fitzroy in which he was to be instrumental in sinking two U-Boats for which he was awarded the DSC. After the war he returned to Prince Rupert, married, had four children and became president of the Chamber of Commerce, as well as being involved with many other local organizations. His war years were commemorated by his pleasure boat, which he named Fitzroy II.He died in Vancouver, BC on 4 February 1990. I had known he was in the navy, but had not known in what capacity he had served until one day I came across many of his old books at the local library. One of which, a signed copy of Convoy by Martin Middlebrook is about HX222 and features Pennywort's part of it..Since then I have been on a quest to find out more, particularily photos of Pennywort, Abelia and Fitzroy. * U-305 had sunk HMCS St. Croix and HMS Itchen the previous year. Photo courtesy of the Prince Rupert Branch of the Royal Canadian Legion.